Today my daughter, Akari had a lesson of classical ballet in the morning, so Hikari, Yuuki and me went to the park near Shimoda harbor during her class. 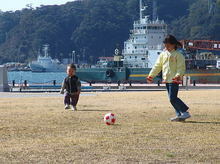 As we had strong wind today, so we tried to play football but could not play it. After that we decided to go to Spa for foot (Ashi Yu) in this park…..
Do you know "Ashi Yu"? This is free of charge to take it for 24 hours. 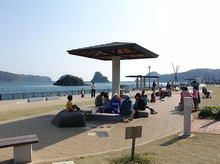 And there is free big parking lot in this park, many people come here to spend a time for taking a walk, fishing, or spa for foot in a holiday. Have you ever tried this kind of spa ? This is only for foot without shoes, of course women and men take it together. My son had ever come here when he was 7 months, so he does not remember it. The water is a little hot, but especially it is very good for foot in the winter. Besides this hot spring make our body very warm through the legs. Why don’t you try it ? Recently most Japanese know "Ashi Yu" as there are a lot of places of this kind of spa. 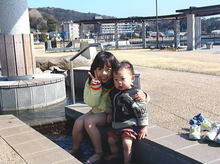 This entry was posted in Family, Travel on 2006年2月25日 by izusakuraya.